Canton - Ruth Heatherly Newland, 83, passed away on Sunday, August 12, 2018 at The Homestead in Clyde. A native and lifelong resident of Haywood County, she was the daughter of the late Bryan and Catherine Burress Heatherly. She was also preceded in death by a son, Craig Butler, two sisters, Madia Clark and Patsy Tyler and three brothers, Woodrow, Roosevelt and J. B. Heatherly. She was a member of Emanuel Baptist Church. Ruth loved gardening especially growing flowers and vegetables and spending time with her family. 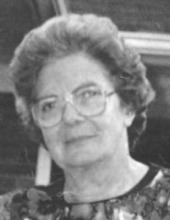 She is survived by a son, Allen Newland and his wife, Julie, of Waynesville; a brother, Harold Heatherly and his wife, Cynthia, of Canton; two grandchildren, Bryan Butler and his wife, Amanda and Brandon Butler and his wife, Brittany; and four great-grandchildren, Caden, Dawson, Hailee, and Raegan. A visitation will be held at 6:00 p.m. on Thursday, August 16, 2018 at Emanuel Baptist Church in Clyde. In lieu of flowers, memorials may be made to Emanuel Baptist Church, 107 Weaver Drive, Clyde, NC 28721.